This hand painted wooden mask was made by Jorge Landero. It is bright in color and makes a nice decor. This is a mask with the scarlet macaw and toucan. 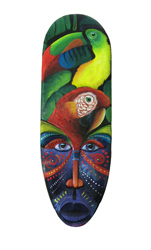 It was hand painted by Jorge Landero, Belizean artist and carved by Carlos Garcia. Art made in Belize!!! 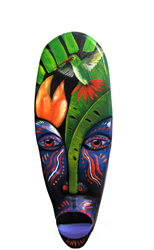 This mask was hand carved by Carlos Garcia and painted by Belizean artist Jorge Landero. This mayan face makes a great decoration on your wall.